In the latest from PBS’ Masterpiece Mystery!, Sir Arthur Conan Doyle’s classic detective Sherlock Holmes enters the 21st century in a new contemporary version that blows away the fog of the Victorian era. 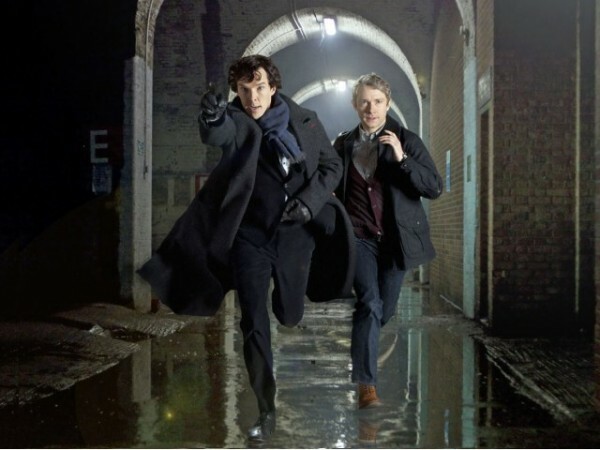 Created by the Doctor Who storytelling team of Steven Moffat and Mark Gatiss, Sherlock airs on October 24th, 31st and November 7th, and stars Benedict Cumberbatch in the title role and Martin Freeman as Dr. John Watson, a retired army doctor that was wounded during service in Afghanistan. Each adventure holds the flair and wit of the original while giving it its own 21st century twist. In an age of forensic detection, computers and online blogs, it is still Sherlock’s brilliant brain and powers of deduction that crack the baffling cases. Question: Once you got this role, how did you decide the way you wanted to approach the character? Benedict: I think I would have been much more concerned about doing a late Victorian Holmes. They have been superlatively portrayed by Jeremy Brett and Basil Rathbone, and those are very big shoes to fill. But, when you know that you will be stepping into some very svelte Hussaint shoes and a nice Spencer Ho suit, topped with a Nigel H scarf and a Belstaff jacket, you don’t have to worry about the traditional set-up with the deerstalker and the pipe. There is enough blank canvas and freshness to the idea to go for it. Benedict: I ate a very good diet, did a lot of swimming, a bit of running, some Bikram yoga and I learned a bit of the violin. I did read the books a little bit and spent a hell of a lot of time learning the lines because he writes as fast as he speaks, so there was a huge volume of material to get under my belt. There was just no room for thought. It vomits out of him. That was the preparation I did for it. Did you do much research, as far as contemporizing him? Benedict: It is the most-played literary, fictional character. It’s in the Guinness Book of World Records for it. I follow in the footsteps of about 230-odd people, in many different languages, at different ages and different times. For any actor to play an iconic character, there’s a huge pressure that’s associated with delivering something that everyone knows culturally, especially in our country. So, it was quite nerve-wracking, but there is an element of a blank canvas because of this brilliant re-invention and re-invigoration of him being a 21st century hero. While it maintains the integrity of Conan Doyle’s original, much to the enjoyment of die-hard fans of the books, hopefully it will turn new people onto the books, which will be a good thing. Did the fact that so many actors have played the character before make it any less intimidating to take on? Benedict: Yeah, in a way, it’s exactly that. It’s a huge, iconic role, but it’s also something that many actors have attempted. Some have failed, some have done reasonably well and some have done superfluously well. There’s just got to be enough of a hook and a reason for me to do what that many other brilliant actors have done before. It’s not the classical Greek plays, or Hamlet and all of Shakespeare’s characters. There’s a huge raft of roles that actors in our culture perform, and you can see any one of about three Hamlets in a year. It’s not something to be completely daunted by. The real hook was the level of re-invention and that I would have the possibility of putting my own stamp on it. How was it to work with Martin Freeman as Watson? Benedict: I had a superb audition with Martin, and I immediately knew that he was my primary choice. He was definitely the person that I immediately sparked off and raised my game for. He’s an adorable man and blissfully, ridiculously funny and entertaining. He’s a great support and companion in real life as well. We have tremendous fun doing the show. Do you think that Holmes has an inborn genius rather than something acquired over the years? Benedict: I think it’s a combination. He comes from a very bright family, but his ability is something that is earned by incredibly hard work and the burning of the midnight oil. It’s not something that he was just ordained with at birth. He’s worked very hard at it. This Sherlock seems to have social skills, but just chooses not to use them most of the time. Would you say that’s an accurate description of him? Benedict: Yes. He uses them when it’s appropriate to the game. It’s part of his armor. What he does do is mercurially slip out of temperament and character to assuage or persuade somebody that they are able to have compassion for one standing in front of him. It may be a widower that he wants to befriend, as a long-lost friend of the man that she’s just lost in her life, to gain information about him because he’s never heard of him before. It could be about trying to get a little bit of outside work done by flirting with a girl that he knows is attracted to him. There’s a cruelty and intention to it all. It is part of what makes him pretty special. When did you first read a Sherlock Holmes story? Benedict: I would have been about 12 years old, when I first read it, and I was hungry for more. It’s just very addictive reading, and it’s an utterly absorbing world. It’s thrilling, as a child, to read those books. You get drawn into a London which suddenly becomes alive like a pop-up book, but brilliant in this other era. It’s just a really rich tapestry of characters and extraordinary adventures. Do you have any stories that you might want to see, if you do more of this? Benedict: Oh, I’d love Irene Adler to crop up. I’d love the Hound of the Baskervilles to crop up. There’s all sorts of things that I’d love to do, or characters that I’d love to be involved, but it’s a mixture of the new and the old. Some of the plot borrowings and deductions, the characters, their relationships and the detail of their lives is very much drawn from the original because there would be no point with messing with what ain’t broke, but as far as adventures go, I think they can definitely take it into new a realm. So, I’m excited about doing things that fans expect as well as letting their imagination have free reign and going new places with it. With both of your parents being distinguished actors, did you always want to be an actor and follow in your parents’ footsteps, or did you ever want to do something else instead? You also have a role in the feature film War Horse, directed by Steven Spielberg. What is that? Benedict: It’s going to be extraordinary. It’s based on the book by Michael Morpurgo, and the incredibly successful stage play, which I think is coming to the States, at some point. It’s been a huge smash hit in London. Is it a World War I story? Benedict: It is a WWI story, and it’s through the eyes of horses. 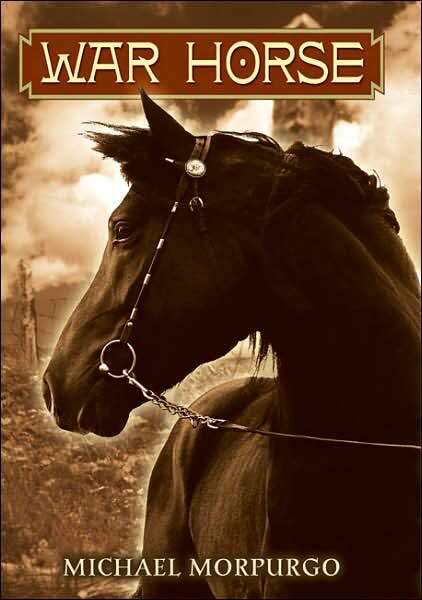 Nine million horses died in WWI, and it’s the journey of one horse from birth in North Devon to being trained by a farm boy and being taken away by the Calvary at the beginning of the first World War, and then being captured by the Germans. The horse is charging into machine guns and tanks. It’s not a first World War version of Saving Private Ryan. It will be a children’s film. Who do you play in it? Benedict: My character is Major James Stewart. He’s a Major in the North Somerset yeomanry and he rides atop this huge, dark, hot-blooded horse. The stage play is remarkable because it’s puppets and this is all live-action. Like the stage play, you get into the horses’ minds through the journey of the horse and their relationships with the human beings that relay them throughout this incredibly complex, unbelievable, voluminous story of the first World War. It’s a brilliant view for children, and for any audience. Did you have riding experience? Benedict: No, not much. I think I rode once, when I was about 12, but I’ve been spending the last six weeks riding non-stop, and then doing the play in the evening. Benedict: Yeah, I have The Whistleblowers and a film called Third Star coming out.